Join 50,000 of your peers by getting the latest content marketing updates delivered directly to your inbox. It’s the same as walking into a dealership with the intention of coming home with a new car the same evening. You’re going to waste your money. Unlike any other content marketing asset, video can get obscenely expensive in a quick hurry. You blow a blog post, no big deal. You blow a 10 minute animated video, you could get fired by your boss. You don’t want that dubious honor. Your first instinct (as was mine) may be to create a short company explainer video for the homepage. Sounds logical, right? All of your competitors are doing it, so why wouldn’t you? “I’d turn their most successful blog post content into a video. That way you have a proven topic that you know provides value to your B2B audience. I 1000% wouldn’t create a demo, explainer video or anything about your company. On second thought, that DOES make sense. So let’s take a data-first approach as he suggested and see what we need to create. Below is some data exported from Google Analytics on the top performing blog posts published this year on Brafton.com. It’s a landslide, clearly “I saw Google naked in the shower” is begging for a video. Now we need to put pen to paper and map out what we want to achieve. Sound overly simple? Good, then do it. It shouldn’t take long. I cannot emphasize enough the need to define quantifiable goals. Specific: I am going to turn my blog post “I saw Google naked in the shower” into a screenshare/animation hybrid video. Once complete, I will upload it to our YouTube channel and embed the video within the article, re-release it on our blogroll as an updated post, distribute to our newsletter email list, and promote on social media. I will create new custom imagery and CTAs for use in social and email marketing. 10% html open rate and 2% unique click-through rate on email. 50 Newsletter subscriptions from all blog traffic. 500 shares on LinkedIn and Twitter combined. Achievable: The measurable goals are fairly ambitious, but within reach. Check. Relevant: This plan and associated goals are aligned with our inbound marketing plan. This fits into the top-of-funnel strategy we have outlined. Check. Time-based: We intend to have the video fully completed and ready to launch by July 1, 2017. After launch, we intend to hit our measurable goals within 30 days. When your goals for a video project are nebulous, the entire direction and vision of the project will follow suit. Having no plan is akin to firing your gun wildly in the air and hoping it both a.) hits something, and b.) hits something of value (but you aren’t sure what that value might be yet). It’s time to get your hands dirty and make this video come to life. But what kind of video is going to satisfy our KPIs? A 2-minute animated video? A 15-minute talking head? A chalkboard animation (please, don’t!). 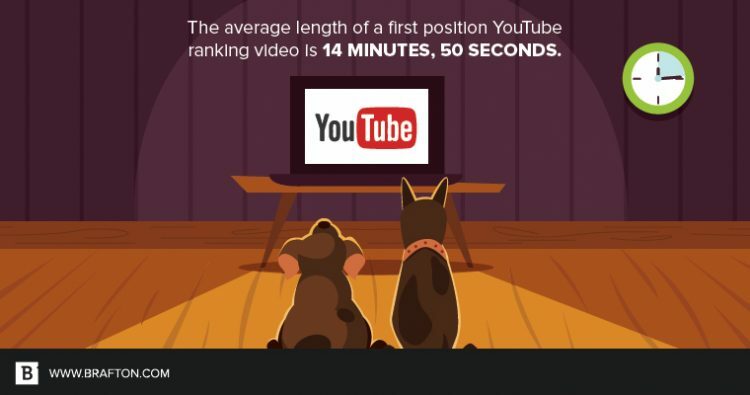 The average length of a first position YouTube ranking video is 14 minutes, 50 seconds. Video comments, views and shares are major ranking factors. 68.2% of first page videos are HD quality. “I’d question the idea that creating longer videos is more expensive. The idea isn’t to create the same amount of videos that you normally would (only longer). You simply create fewer videos, but make each one longer and better. For starters, I’m not going to argue with the data or logic. Brian clearly outlines a recipe that calls for a super engaging, 15+ minute, badass video. Volume is out the window; we need to make this video our legacy. My vision is now for a 15-20 minute video in which someone narrates the experience discovering the Google algorithm anomaly described in the blog post. We will use a combination of screensharing and animation/production effects to help explain our point in a way that is informative, but conversational. I want to inspire the audience to share their opinions, for reasons to follow. So now we kick up our heels and wait for the audience to love us and bring us wheelbarrows of money, right? Upload to YouTube: Get your video up on your channel – you are going to be using this page and embed code many, many times. Use your appropriate keyword tags and meta descriptions, but understand they will have very little correlation with rankings. The same goes for using an exact match keyword in the title. Update your blog post: Plenty has been written about getting additional mileage out of your top content. We will add a line to the beginning of the article noting it as “Updated July 1, 2017.” We will also ensure that we update our metadata so that Google understands this article is a new version. Within the first fold of the article we will embed our YouTube video, ensuring that we selected the appropriate player size for our blog layout, and unchecking “show suggested videos when the video finishes” so that pesky competitors or unrelated videos play through. Distribute: Create a CTA for your email and social that will entice people to click through to the article and post on your channels. Also, embed the video on social platforms for direct playing. Luck is definitely part of it. I’d say getting lots of comments is 60% science, 20% art and 20% luck. In the blog post: We will probably drive few comments from the actual blog post, but we want to do our due diligence nonetheless. At the conclusion of the article, we will link to the YouTube video page and ask the audience about our conclusions drawn from the data. In our plan we determined that we would evaluate the video’s performance after 30 days of launch. Do that. Evaluate your metrics objectively and without excuses. If you hit your KPIs, excellent. More importantly, if you haven’t, make sure you learn from your bad data. Find out where the gap was in your plan. Perhaps email underperformed. Perhaps your social media strategy wasn’t as engaging as it could have been. With every bad number there is a lesson to be learned. You have finished your video, but you have barely started your YouTube marketing strategy. At this point you need to build out the most robust YouTube channel in your space. But where do you go from here? Should do: Define your channel positioning. There are already a million channels on YouTube. What will make yours unique/different/better than the rest? This will help inform your entire strategy when it comes to topics, keywords, video production and editing. Shouldn’t do: Put up a few videos to “test the waters.” This is a mistake I made with YouTube when I first started my channel. Instead, using your positioning, create a few high-quality videos that are in-line with what your channel is all about. What is going to make our channel unique? Will it have a theme? Should it be an analytics-based channel? Should it be a content marketing channel? Will all our videos follow the same format? How will we define its success? In summary, everything we do needs to be clearly outlined and quantified. Creating a video marketing strategy that doesn’t turn into a $10,000 bonfire requires patience and planning.